We’re piloting a WISE Sports Leadership Program in 2019! 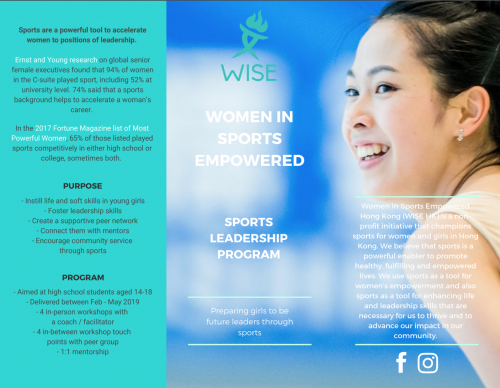 Aimed for high school female students between 14 – 18 years old, the WISE Sports Leadership Program provides immersive learning program to prepare them to be future leaders through sports. Learn and develop useful life and soft skills | Practice leadership skills | Support and network with girls from other schools | Connect and engage with mentors and role models | Do service within their community by either starting / coaching / captaining / organizing sports activities, events or team. The program is facilitated by Rachael Lau of ByoBeat.